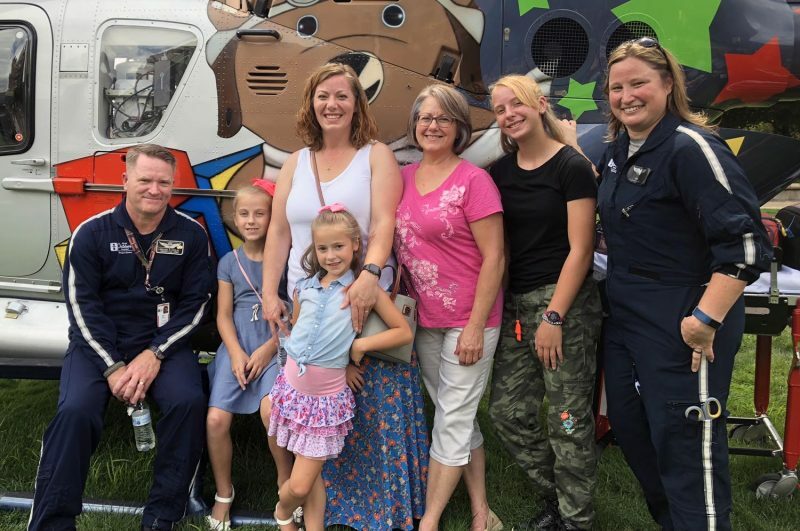 After being emergency transported on Air Bear just 3 weeks ago, Jocelyn Traw, 9, had a chance to meet and thank the team who cared for her: pilot Bill Knisley, respiratory therapist Summer Oney and pediatric nurse Sarah Dech. 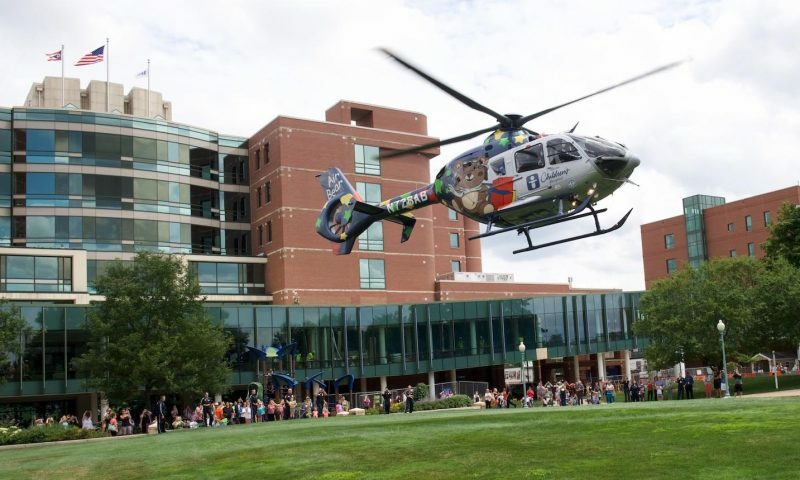 The memory that sticks with Sarah Traw was the calming effect the Air Bear medical helicopter crew had on her after it arrived at Mercy Health St. Elizabeth Youngstown Hospital. Sarah’s 9-year-old child, Jocelyn, had been hit by a pickup truck July 1 while riding a bike in front of their house in Mineral Ridge, outside Youngstown. Jocelyn suffered multiple skull fractures, and her condition was deteriorating. She became unresponsive and had to be intubated in the Youngtown emergency room. 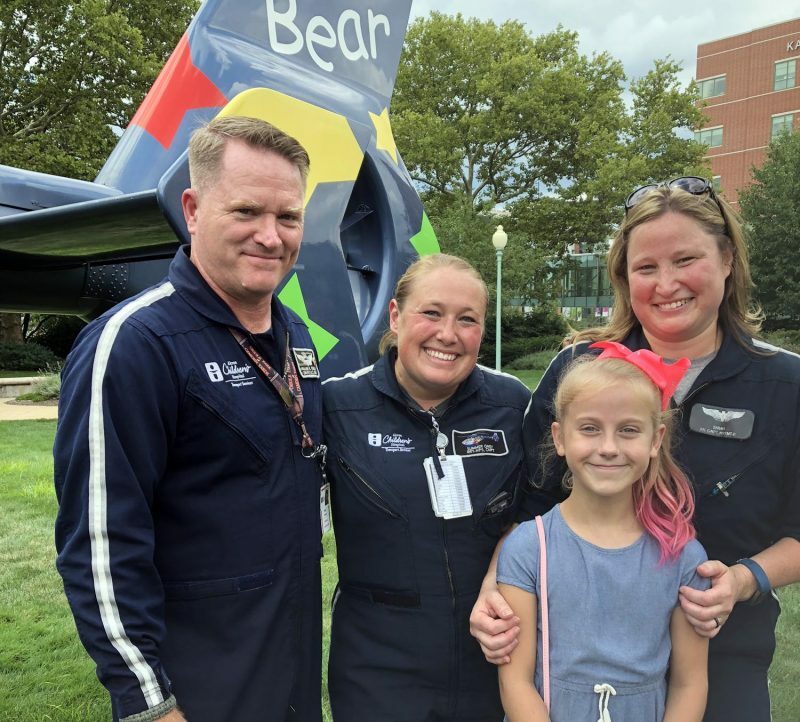 The panicked mother said she felt a degree of comfort as the Air Bear crew went to work, talking with the family and medical staff and preparing for the 20-minute flight to Akron Children’s Hospital. The Air Bear crew circles around the medical helicopter as Chaplain John Morgan gives a blessing and children blow bubbles. Listen to the blessing on Twitter. Sarah was invited to speak at the event after emailing transport manager Rhonda Reed to express her appreciation for the care Jocelyn received. Sarah doesn’t like public speaking – the very idea makes her queasy. But she felt she had something that needed to be said. Jocelyn underwent neurosurgery and she is recovering well. She stood with her mother and posed for photos with the Air Bear crew Monday, wearing a broad smile. The Traw Family with Air Bear crew during the 10th anniversary event: mom Sarah, patient Jocelyn (at left), sisters Samantha, 7, and Sylvia, 14, as well as grandmother Kendra Whittaker. Children stood in line to get a glimpse inside the helicopter, which had descended into the grassy park to kick off the anniversary celebration. 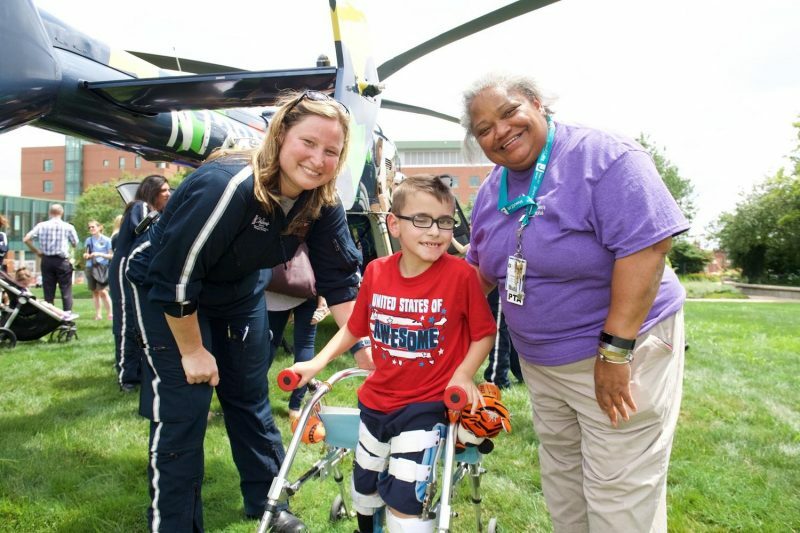 During rehab, Cameron Offenberger, 8, walked out to the event with his physical therapist assistant Turranna Rice. Air Bear pediatric nurse Sarah Dech told him about the helicopter. Crew members in dark-blue flight suits formed a perimeter as the helicopter landed to a round of applause. 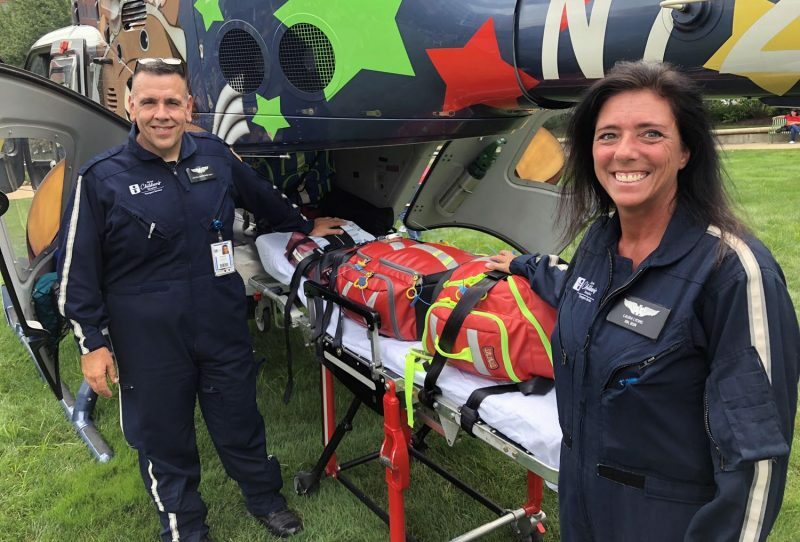 The chopper, owned and operated by Med-Trans Corp. of Texas, travels at about 150 mph on average, with an Akron Children’s paramedic, critical care nurse and respiratory therapist on board. Watch a video of it landing on Twitter. Christine Young, chief nursing officer and vice president of patient services, welcomed the crowd. Air Bear has been a regional asset for critically ill and injured children, she said. 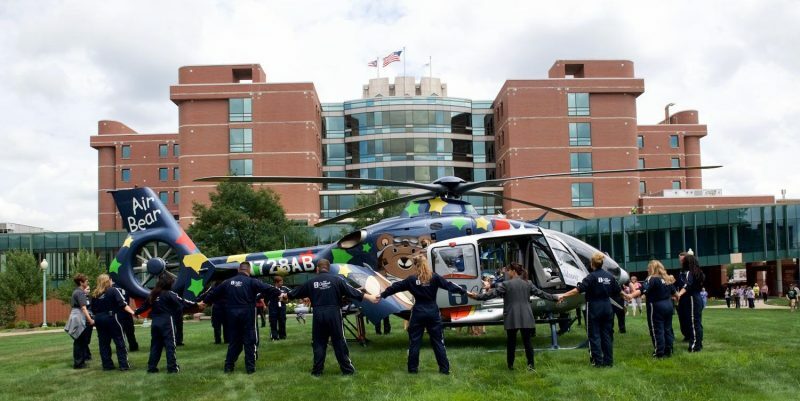 “Air Bear is Ohio’s first pediatric dedicated medical transport helicopter, and in the 10 years we’ve been in operation serving our communities, we have transported over 3,500 children to Akron Children’s Hospital from 28 counties,” Christine said. Paramedic George Destefano and RN Laura Lyons show the patient cot and entrance. Paramedic George Destefano has been with Air Bear since the beginning. George helped kids and adults step inside Air Bear for a look during the anniversary celebration. He said he was a factory worker when he decided to become a paramedic. In 10 years of serving our communities, our Air Bear critical care transport team has provided safe, effective quality care to 3,556 children. 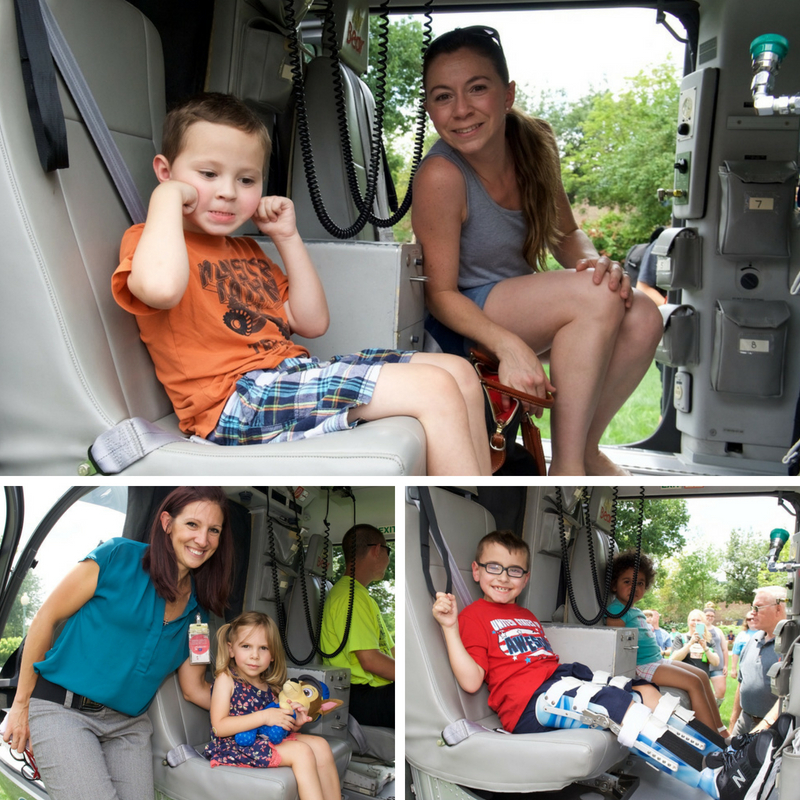 Clockwise from top: Austin Weber, 4, with his mom, Nursing Administration employee Michelle Weber; patient Cameron Offenberger; Brianna Lucey, 3, with her mom Jamie Lucey, who works at the Research Institute. 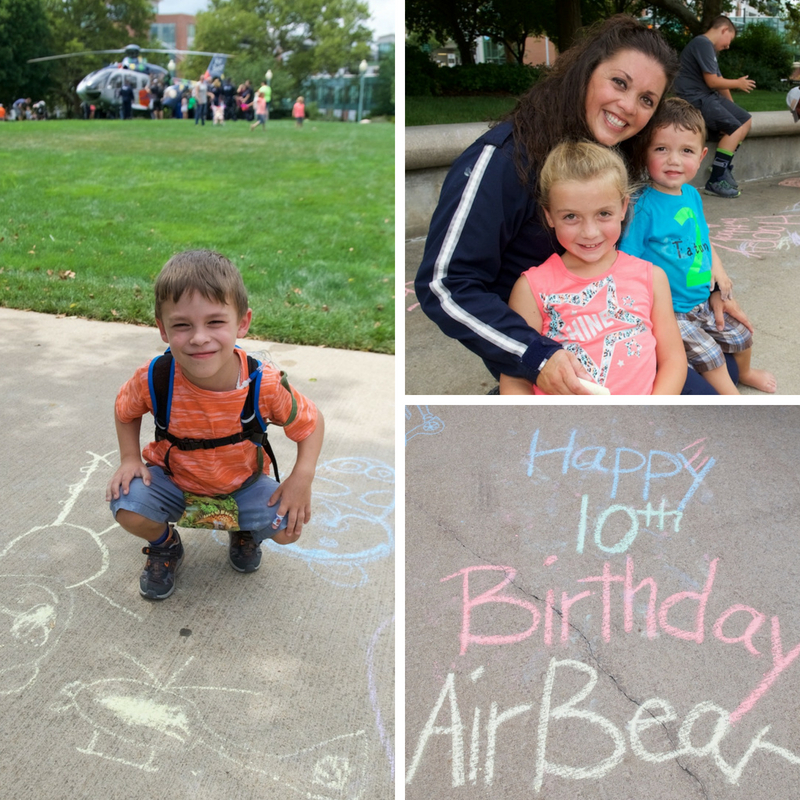 Clockwise from left: Benjamin Chikosky, 6, of Stow, loves Air Bear and was really excited to see it up close and draw about his experience; Air Bear’s Kerry Garrett, RN, celebrated the anniversary with her children, Hudson, 8, and Tatum, 2. She has been on crew since its debut.